Our school museum started as a museum of pioneer organization. For over 24 years the collections have gone on growing. Today it is a museum of old, interesting objects. They come from different spheres of life and from hundreds years of history. Every exhibit reveals the skill of its maker and tells us about the time and place in which it was made. The museum houses a rich collection of documents and exhibits telling about the history of Chekrushevo , first ploughed field of Tara Priirtyshje, of collective farms(kolkhoz), culture, traditions, national costumes of people. The museums numismatic collection numbers a lot of medals, orders, coins, paper money. Here you can also get acquainted with the military history of Chekrushevo. The exhibits about the Heroes of the Great Patriotic War, local war conflicts remind glorious pages of our history. There are materials about our school, kindergarten and teachers. The collections are studied by pupils to increase their understanding of the history of our native place. There are educational programmes, special events, talks and tours, excursions. Our “School Museum club “ leaded by history teacher Madeeva Tatyana Uryevna are winners of School museums contests. 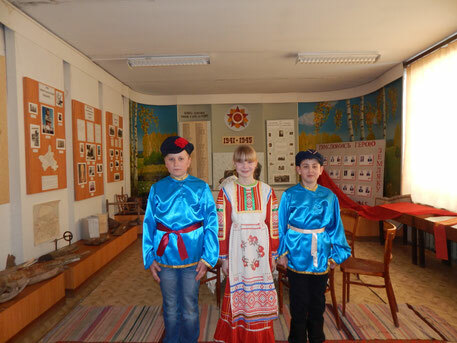 The museum offers guided tours covering different topics for schoolchildren, guests and people of Chekrushevo. The tours are led by guides who have been trained at the “School Museum club” and last about half an hour.